ADAMSTOWN, Pa.—American Made Matters, an organization dedicated to educating consumers on the importance of buying American-made products, is holding the 2nd annual American Made Matters Day on November 19th. The purpose of the event is for consumers to buy at least one U.S.-made product on this day, and to encourage consumers to buy made-in-USA products throughout the upcoming holiday season to show their support for US manufacturing. "America's economy can only thrive and grow when we prioritize buying American," said Pennsylvania State Representative Mindy Fee, in a release from American Made Matters. "I'm grateful that American Made Matters encourages consumers to prioritize buying American-made products when making their holiday purchases. Let's keep American businesses strong, and just remember that American made does matter." "Buying American made products creates jobs, stronger communities, independence and security for our country, an improved national economy, safer products, and a more environmentally friendly planet," said Don Rongione, president and founder of American Made Matters, in a statement. "Each of us can make a difference every time we make a purchase. American Made Matters Day was created as a call to action to use our individual purchasing power on November 19 and during the holiday shopping season to make a difference for our future." The U.S. Bureau of Economic Analysis reports that every $1 spent on American-made goods invests an additional $1.32 in the U.S. economy. If Americans dedicated just a small portion of their holiday shopping budget to buying American-made goods, it could have a very positive impact on our economy. In fact, according to ABC News, if each American family spent just an extra $49.95 on American-made goods, the spending would generate 150,000 American jobs. "Living in America and being a business owner allows me the freedom to manufacture all of my products here in America because of those like my father, who is a double purple heart Vietnam War Veteran," said Arianna Russell, CEO of Bodacious Cases. "I feel I owe it to him and to all those who served, protected, and fought for our freedom and lost their lives. Making my products in America is a way to thank them. In other countries, I would never have the freedom to be the inventor, owner, and CEO of a company. As a country, all of us small businesses have to stick together, so we can make a bodacious difference and keep and create more jobs here for the future generations." 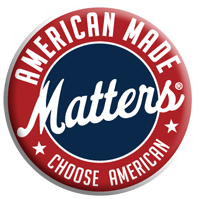 American Made Matters® was launched on July 4, 2009 by the Bollman Hat Company, America's oldest hat manufacturer. Said to be the only organization committed to promoting American-made goods that is run solely by manufacturers, it has over 300 member companies located in 45 of the 50 states of the United States. For more information, visit www.americanmadematters.com, or like them on Facebook at www.facebook.com/AmericanMadeMatters.